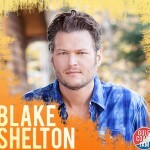 The 2014 Pepsi Gulf Coast Jam (PGCJ) is a three-day country music festival that will be held on August 29th, 30th, and 31st in Panama City Beach (PCB), Florida. This three day event will be packed full of musical talent. 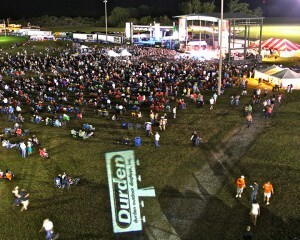 The Music Festival is launching its second annual festival with a bang, and Durden Outdoor is a proud sponsor again! In its inaugural year, Pepsi Gulf Coast Jam attracted thousands of country fans from all over the United States and beyond with a lineup that included Toby Keith, Brantley Gilbert, Trace Adkins and many more. Executive Producer of Pepsi Gulf Coast Jam, Rendy Lovelady, is expecting 2014 ticket sales to far exceed the attendance that the festival drew in 2013. 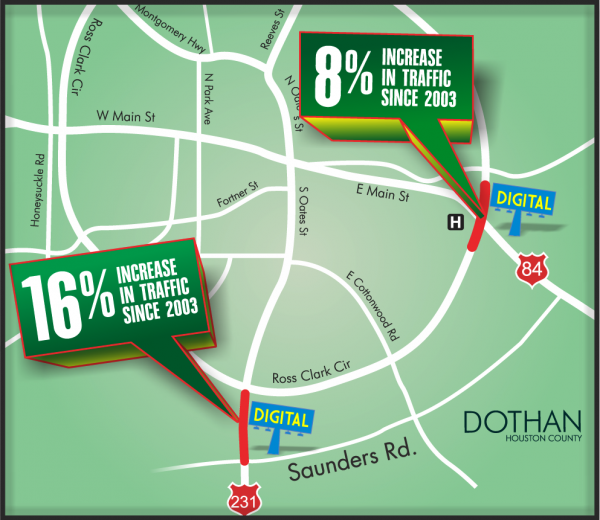 With the help of Durden, they were able to reach locals and Florida beach travelers in the following Alabama markets: Dothan, Eufaula, Geneva, Enterprise, Ozark, Headland, Abbeville, Troy, Brundidge. PGCJ is utilizing multiple of Durden Outdoor’s billboard mediums (Rotary Posters, Digital Network, & Static Bulletins) to advertise their headlining acts that will be performing Labor Day weekend in PCB. 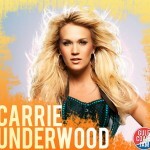 Country music’s superstars Blake Shelton, Carrie Underwood and Dierks Bentley are this year’s headlining acts. Carrie is set to headline Friday, August 29th, while Dierks headlines Saturday, August 30th, and Blake closes out the festival, headlining Sunday, August 31st! 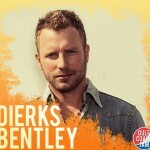 What should you expect at Pepsi Gulf Coast Jam? During the day, find yourself with white “sugar” sand beneath your toes and ocean waves washing up on the shore at our beach stage located at the M.B. Miller County Pier (12213 Front Beach Road). As the sun begins to set, shuttle over to Frank Brown Park (16200 Panama City Beach Parkway) and JAM out to our star studded headline stage late into the night. Once you’ve had far too much fun for one day catch some shut-eye in your beachfront condo or hotel. Multiple condos in Panama City Beach are providing various packages that include room rates & passes to the Music Festival. 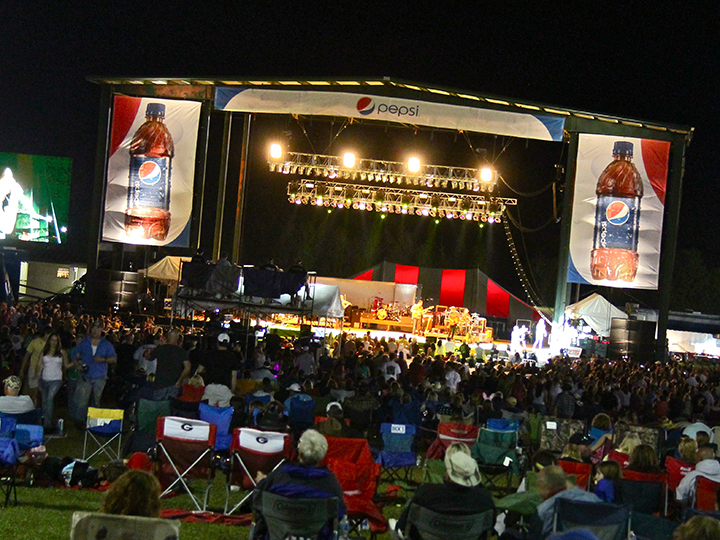 Want to stay up to date on what’s happening at Pepsi Gulf Coast Jam? An app is now available for download on all iPhone and Android mobile phones through the app store. The app is a great resource for deals, info, schedules, and photos. 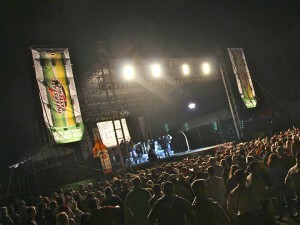 For more information about Pepsi Gulf Coast Jam’s lineup, VIP & General Admission Tickets, lodging partners, directions, partnership opportunities, parking, and vendors, please visit www.gulfcoastjam.com. Pepsi Gulf Coast Jam is a production of PCB Entertainment, LLC. If you are interested in utilizing out-of-home media to promote your next event in South Alabama please contact our sales team. We can help you reach over 1 million cars (daily) about your upcoming local or long distance event. Click here to email the Durden Sales Team. 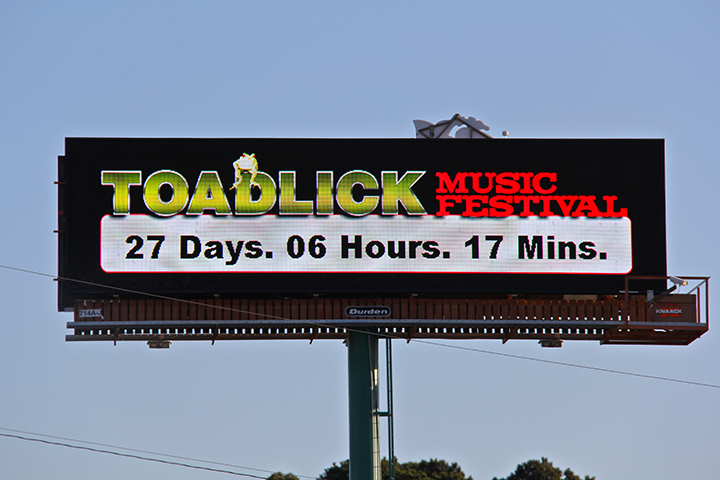 To help promote the Toadlick Music Festival, Durden Outdoor utilized multiple digital billboards in their digital billboard network to feature the top music artists that will be performing in April of 2014. Durden’s Creative team also developed (in-house) a custom-built, 3D, 30-foot toad tongue at the festival ground’s billboard. You can see the toad’s tongue from ten miles down the road snatching up its tickets for the festival. 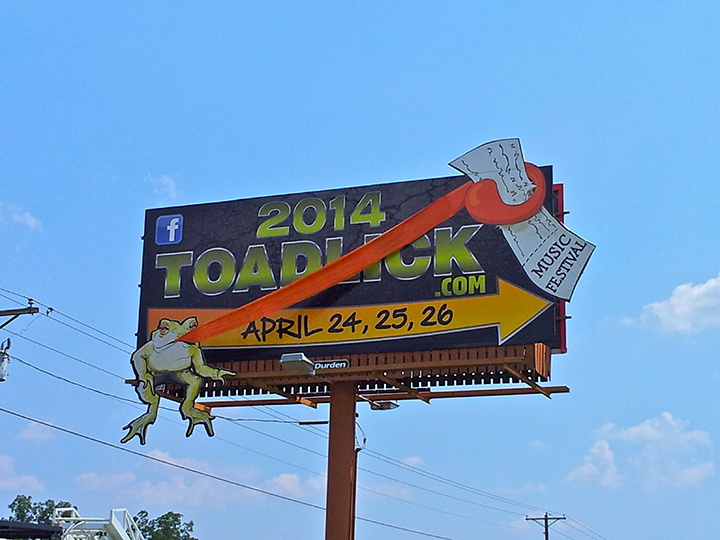 If you are interested in more information or tickets for the Toadlick Music Festival Please click here. 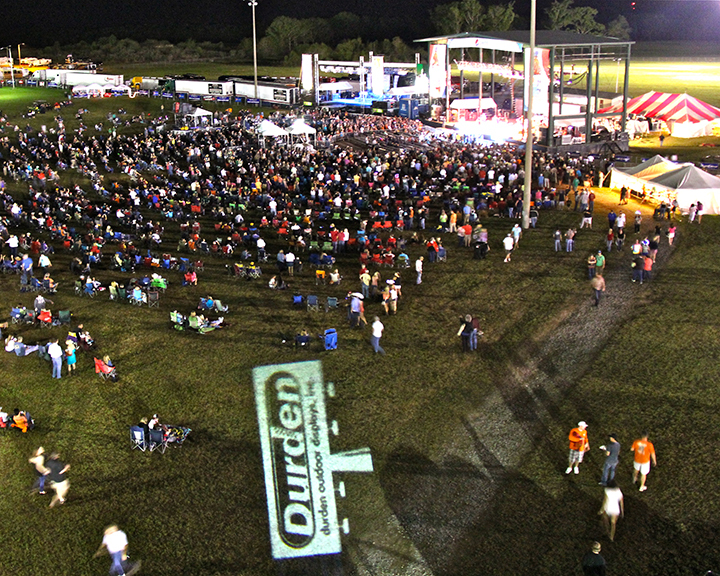 If you are interested in utilizing the Durden Billboard Network, as Toadlick did, to promote your next event please contact our sales team. We can help you get the word out to over 1 million cars (Daily) about your upcoming local or long distance event. Click here to contact our sales team.